Welcome to the US Hawks. Welcome to US Hawks, Gary! I totally agree with the system that keeps the rating permanent. I was member of the USHPA in 2016 and when I learned that lapsing in their membership nullified the rating, I contacted them saying that was ridiculous and abusive. People may simply be member of another association and/or still fly. Even not flying several years would not affect much the skills that can be regained easily with some practice. It did not change the USHPA minds. So, I would like to apply to the Hawk 5 based on my HPAC advanced rating. There is no flying rating higher in Canada. I have flown several sites in Canada, USA and France in all sorts of conditions. I have done a few towing flights, most of them going cross-country. 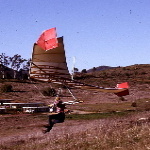 The only issue maybe is that I have flown three different types of hang gliders. But then again, I also fly and have flown paragliders (many types), have flown ultralights (3-axis) and monomotor aircrafts. I have an online distance flights log (in french only) at http://mt7.ca/mesdistances.html where you can see most of the sites flown. Administrative Note:  Hawk 5 Rating pending decision on handling of non-USHPA ratings. First, thanks for joining the U.S. Hawks!! You bring us the happy problem of addressing a somewhat "nonstandard" rating application. Please be patient with us while we figure out how to best serve your request. Our current procedures are defined in the topic titled: "Official US Hawks Rating System and Issued Ratings". Those procedures allow us to issue ratings based on any existing USHPA ratings. If the existing USHPA rating is "current" (according to USHPA), then we issue a U.S. Hawks rating immediately. If the rating is not current, then the Board will investigate to see that it wasn't removed for any flying-related reason. The Board will then vote to issue the rating or not. I am very familiar with the process because I went through it myself as a result of USHPA expelling me in 2015 based on my 2014 testimony in a law suit (the lawsuit was settled in a manner that the "USHPA insiders" didn't like). Since you had a USHPA rating in 2016, the easiest route would be to submit that rating information. But we can also start considering how to handle non-USHPA ratings such as from the HPAC. As I said, this is a "happy problem" and I appreciate you helping us expand our procedures. The ridiculous aspect of how USHPA does ratings is that I have never dropped my membership (since the beginning of USHPA). However, I did the no insurance, cheaper, non-flying membership for several years and they pulled my rating even though I was still a paying member. Fortunately, I still had a card from years ago that showed the intermediate rating (which is now H3) so US Hawks gave me their H3 rating. Since then I have also restored my USHPA H3 rating. You could be flying every single day, but if you're not paying full price into their monopoly, they pull your rating. USHPA isn't about flying. USHPA is about USHPA. I also have a P2 PG rating not yet visible online because their webteam guy is not working and they fired me illegally last year (I was on the webteam), but you don't count these. Thanks for that link Serge. Member #122 looks like a pretty low number. Now we just need to develop a policy for equivalent HG ratings from Canada. 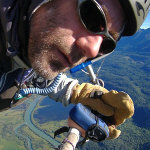 Since we are a hang gliding association, we don't issue ratings for paragliding or other non-hang gliding sky sports. Please be a little bit patient because it may take some time and discussion to decide how we are going to handle non-USHPA rating transfers. As I mentioned earlier, it's a "happy problem" for us because it shows that we are growing. P.S. I just started a topic in the "Issues" forum ( Board index -> U.S. Hawks Hang Gliding Association -> Building the US Hawks -> Issues for the US Hawks Board of Directors -> Canadian Ratings ) to discuss the issue of transferring Canadian (and possibly other) ratings to the US Hawks. Since you have some experience with the Canadian system, please feel free to help us think through a good policy for issuing such ratings. Thanks again. Please consider my application for US Hawks 4 rating. Now flying: Moyes X2, Falcon 3 Tandem. Administrative Note:  Hawk 4 Rating issued on November 8th, 2017 based on current USHPA rating. Based on the information available, the US Hawks H4 has been awarded.